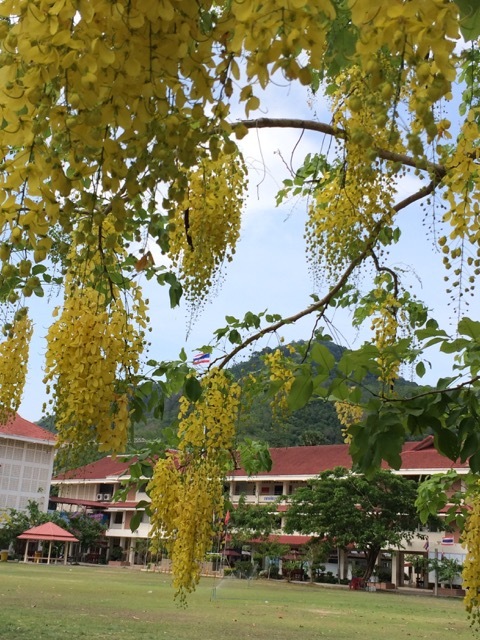 I arrived in Phuket in late March 2015 amid the stunning beauty of the hot season. All my favorite flowers from large trees were in full bloom, and the sky had a beautiful blue hue. The heat and humidity greeted me and welcomed me home. I love Thailand at this time of year. However, this visit was unlike any other. It was an urgent one to visit my mom whose health had worsened since my visit just a month before. I only had a chance to admire the season’s beauty from the car window because I had come to spend whatever precious moments I could with my mom. I had my blessing, as we were able to give each other hugs and say our farewells just two days before her passing. In accordance with the tradition in our region, a celebration of her life followed immediately afterwards. 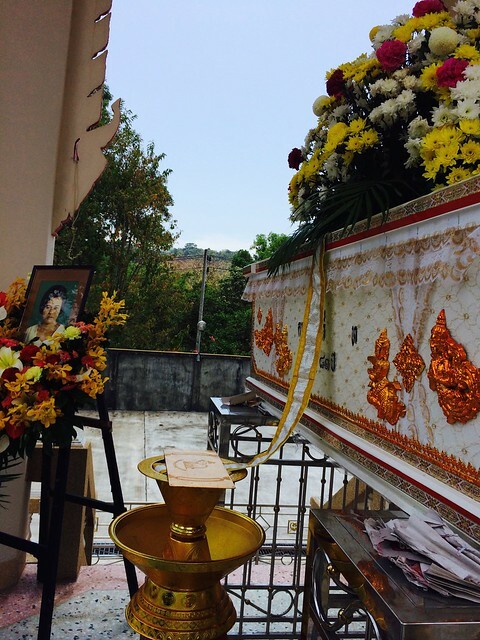 Her funeral was held for six days; the last day was the cremation day. These events all took place on the grounds of our village monastery in a special section where there was a large hall, praying chamber and a kitchen. Over 3,000 friends, relatives and family paid tribute, and on the cremation day, over 145 monks and novice monks and hundreds of people came to honor my mom’s life. She is missed and loved by her family and community. In honor of Thai culture and Thai-ness, I am sharing these stories and pictures with you. I hope you can read with your open heart and mind and that you learn something of a different people and culture. 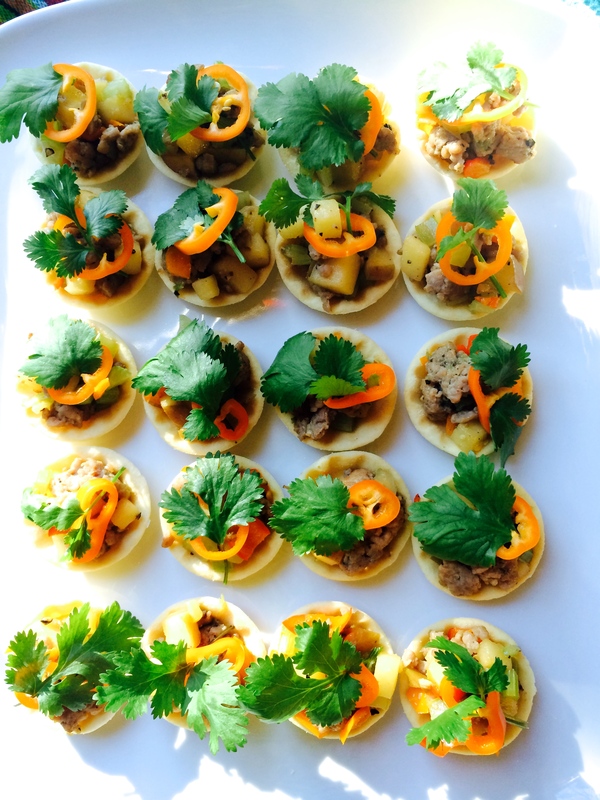 In February 2013 I wrote the post Thai Monastery Kitchen about Thai culture and the cuisine at a Thai funeral or celebration of life. I hope you had a chance to read it and see how Thai culinary traditions and culture revolve around the Thai monastery kitchen and event hall where we share food, mourn, laugh, and mingle. Just two years after that post, my four brothers and my sister and I were suddenly very busy organizing all the details for my mom’s celebration of life. Because the system for doing this event is already in place and the ritual is the same for everyone, there is nothing to reinvent but from 5:30 am till 10 pm each day we were busy shopping for foods and serving them. 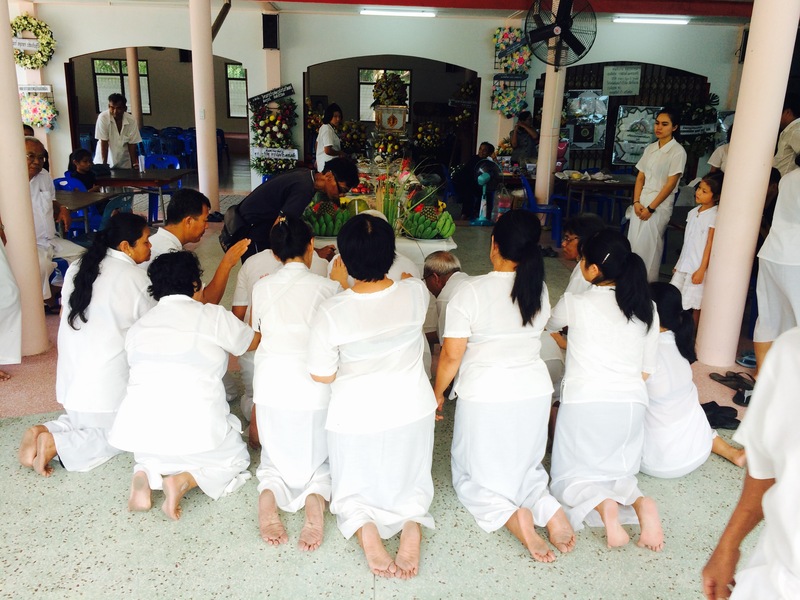 My mom’s funeral was held in our village monastery hall which was attached to a large kitchen. More than 25 dining tables were set up so that when friends and relatives visited and gave their condolences, the foods and drinks could be promptly served. We steeped tea in a large pot and always had two types of tea: a Thai tea with a hint of sweet and a fragrant Pandan Jasmine Tea. As guests arrived, we welcomed them to sit and promptly served them tea. My brothers, sister, and all of the in-laws wore black and white and greeted and served with care the friends and relatives from near and far. About 500 people visited each day and the kitchen was always busy with commotion during lunch and dinner time. Generous donations from everyone helped us to keep this tradition alive. It is a big part of helping us mourn the loss of a loved one and I had good visits with many relatives that I hadn’t seen for over 25 years. At the funeral, a 10-foot-long table was covered with symbolic and auspicious foods, then groups of related kinship in a clan were called to pay homage, group by group. The first group was the deceased’s children and their spouses. The photo above is of my sister and brothers and their spouses. The next group called is the deceased’s brother and sister, and so on. We added this step to our Thai buddhist ceremony before the cremation to honor my mom and our family’s Phuket Baba culture. At the crematorium everyone lined up to pay their respects and say farewell. My mom had always admired Jee Lah, the head chef and caterer for most events in the village. Jee Lah was about to go on vacation when my brother asked her to be the cook for the six days of my mom’s celebration of life. Jee Lah agreed to honor my mom’s wish to have her cater her celebration of life. We were so fortunate to have her. 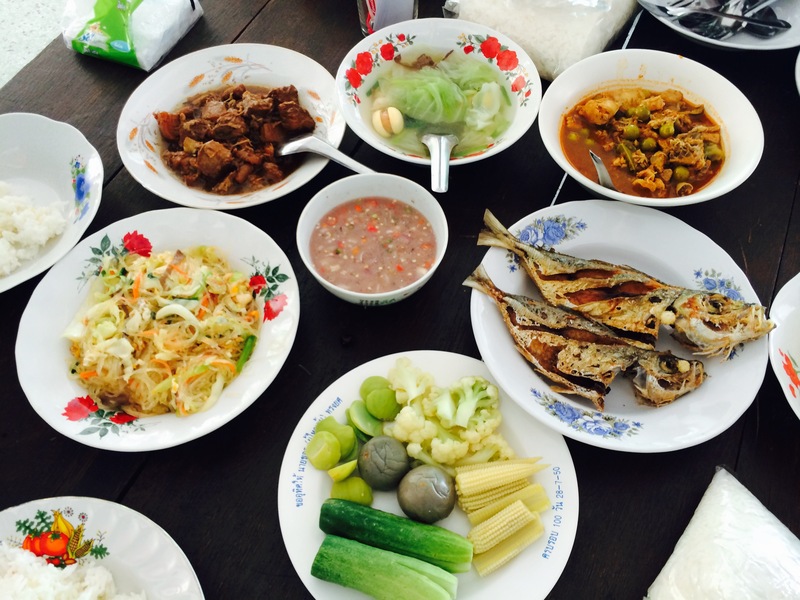 Jee Lah specializes in Phuket cuisine and local popular dishes. She created the menu for each day. The foods was real local cuisine expertly prepared with the best taste and quality and she appreciated how all our brothers and sisters made her job easier. Above, my sister Rudee is preparing fruit platters for snacks or after-meal palate cleansers. 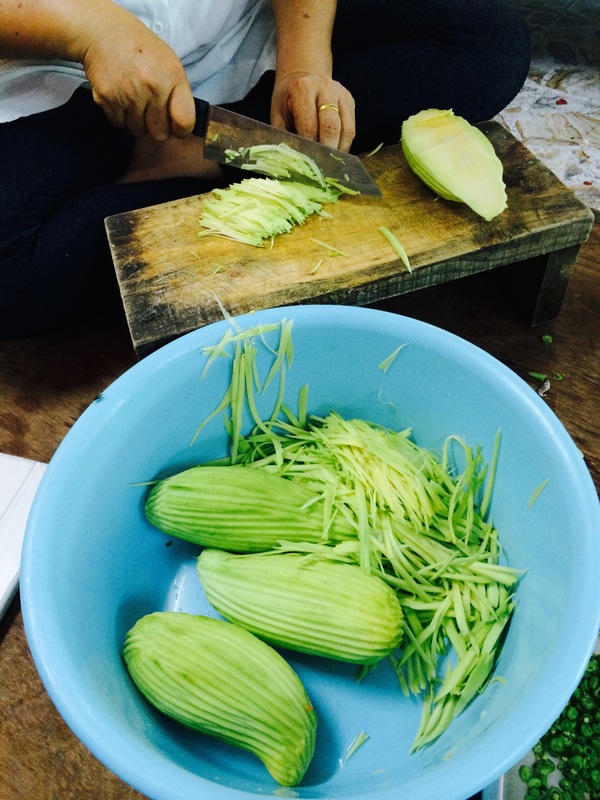 In this photo she is preparing sliced green mango and rose apple with nam play wan – น้ำปลาหวาน – a fruit dipping sauce. We served my mom’s favorite ice cream to our guests. Above is a Thai vegetable accompaniment to Nam Prik – น้ำพริก – hot sauce. There are cucumbers, young corn, cauliflower, and Thai eggplant. Technique is so important and cooking for 300 guests each meal means there are many helping hands for the long hours of patient and hard work. The snake beans here are sliced thin like paper in an oblong. 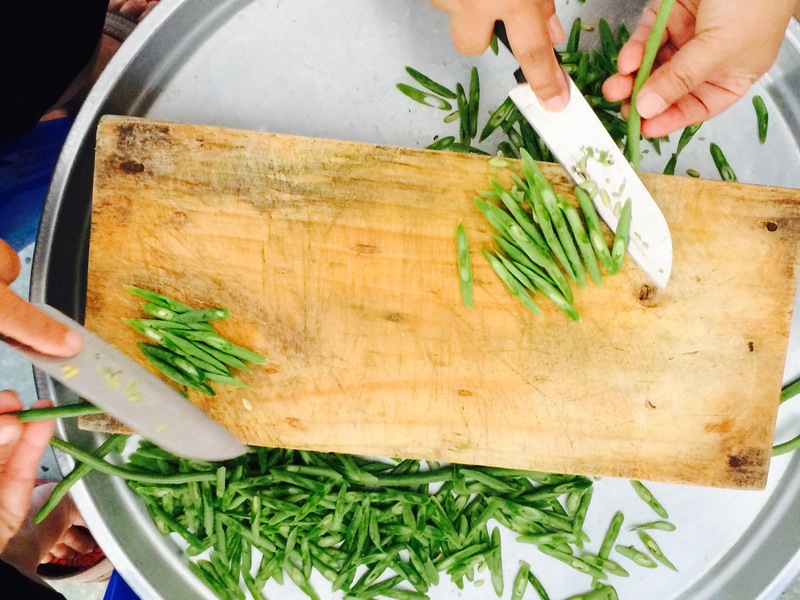 This preparation is for Thai Southern bean salad. 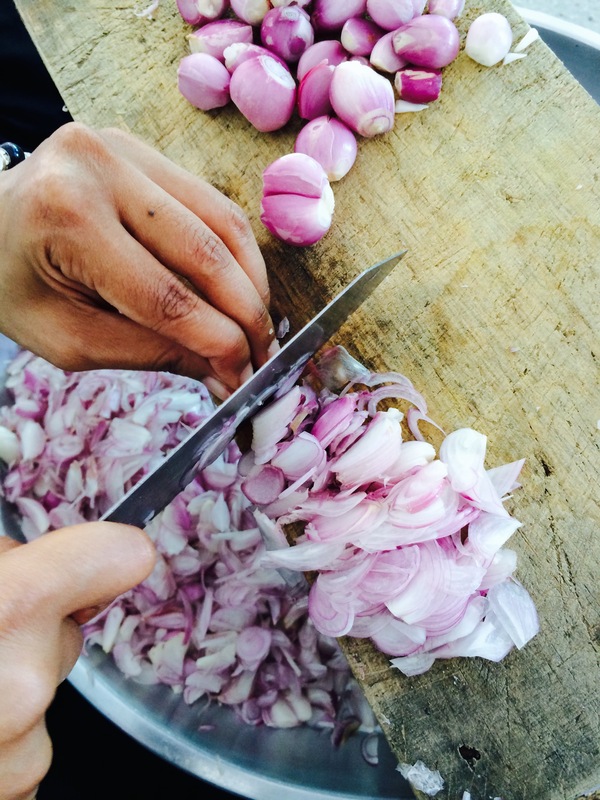 In Thai cuisine we use a lot of shallots. Slicing them very thinly, like paper, is always important to allow them to combine well in a salad, chili dipping sauce or making fried shallots. Green mango is shredded into thin strips for green mango salad. One could use a julienne peeler to accomplish the work but for the beautiful looks and best quality, hand shredding is preferred. The meat from these large fish was for a Hua Mok – a fish cake steamed in banana leaf. The yellow batter that Jee Lah was spooning from the large pot into a banana leaf in the earlier photo was 90% fish meat and the rest is spices and herbs. 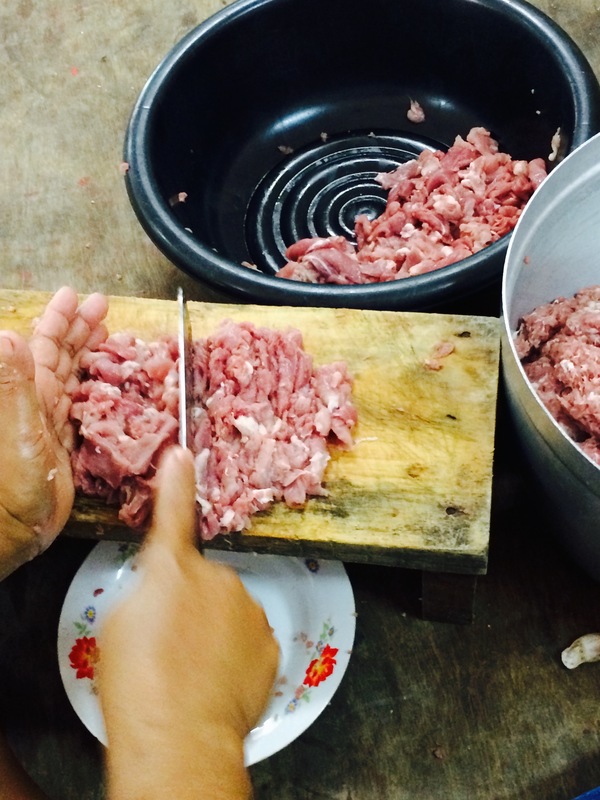 To make minced meat for soup or meat balls, first slice the meat and then chop it repeatedly with a cleaver until the pork is minced into small pieces. Everyone worked hard to make everything well to honor our mom. All of the hard work serving the mourners was helping us with the mourning as well. What to expect if you are invited to a Thai Funeral. Phuket Chicken Biryani Rice, also known as Kao Mok Gai, is a well known Thai-Muslim rice dish. Southern Thai cuisine gets its distinguished flavor from the neighboring countries of Malaysia and Indonesia. Growing up in Phuket I loved the diversity of our local cuisines. Our family cooked Thai and Chinese cuisines and at the market I enjoyed Thai Muslim cooking. After Persian Muslims settled in Phuket, their descendants took their traditional Biryani Rice and created a Thai variation, Koa Mok Gai. It is cooked for special occasions like weddings or during Ramadan. 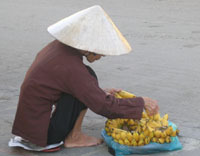 It is not a common dish to cook at home but most of the time we can purchase it from Kao Mok Gai vendors. If you want to try it when you visit Phuket, stop by an open air market in Bangtao or Kamala. Over the past 10 years I have stayed in contact with a few chefs from Bangtao and Kamala Village. I learned to cook Kao Mok Gai from Varunee, my Thai chef for the culinary tour in Phuket. Her mom is a renowned caterer among the Muslim population in the Bangtao area. Over the years, I have written down many versions of her Kao Mok Gai. The other day I wanted an easy lunch, which led to the creation of a quick and easy version of Kao Mok Gai. It took me 10 minutes to make, since I already had the ingredients in the house. It may take you 15 to 20 minutes to prepare the ingredients. If you have an old-style rice cooker that is easy to clean, I recommend using that. Otherwise place everything in a Pyrex 9″x13″ pan and cover neatly with foil, bake in an oven at 350F for 25 minutes and let rest for 10 minutes before removing the foil and serving. Rinse the rice and drain, put in a rice cooker with water, fried garlic, canola oil, curry powder, lemongrass powder, galangal powder and bay leaf. Mix well and place cooked chicken in the center of the rice cooker, cover, turn on rice cooker. It takes about 30 minutes to cook and then let it sit for 15 more minutes before serving. Buffet Style: Place rice and chicken on a nice platter and garnish the top with fried garlic or shallot. Served with condiments suggested below (please also see photo). Individual serving: One cup rice, 1 piece chicken, garnish with fried garlic served with condiment and sauce. Condiments: Sweet chili sauce, sliced cucumber, sliced tomato, cilantro and green onion. 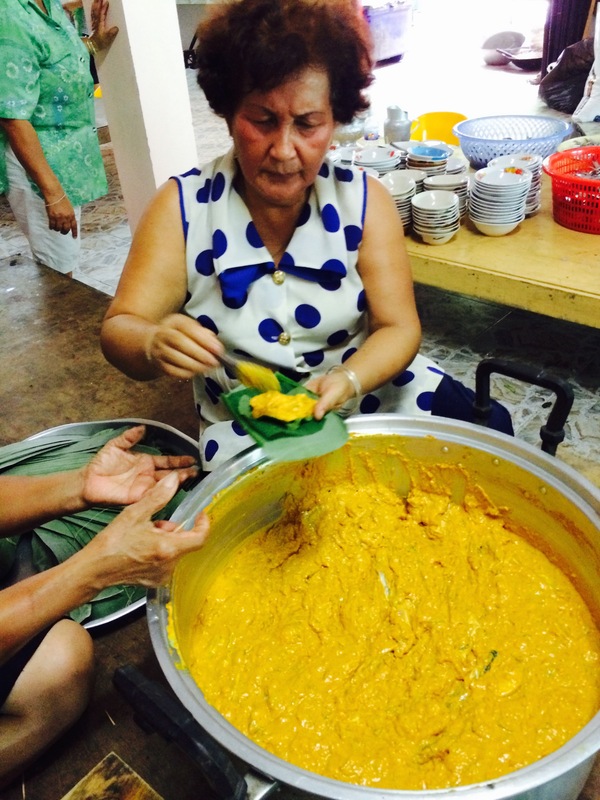 Here is a famous Kao Mok Gai prepared by Varunee’s mom for 250 children. I hosted this event for school children at the Kamala Beach School 6 month after the Tsunami. We served the food at the temporary kitchen in July 2005.